As much as a GSX-R1000 owns the racetrack, the GSX-S1000 owns the street. Developed using the attributes of the championship winning 2005 – 2008 generation GSX-R1000, this sportbike carries the spirit of the Suzuki performance to the street, with shared technology and components packaged into a chassis designed specifically for all-day riding comfort. It’s more than just an attitude, a spirit, or a lineage though; it’s about performance-packed hard parts evolving from one generation to the next. The GSX-S1000 is powered by a 999cc inline four-cylinder powerplant that’s based on the legendary long-stroke GSX-R1000 engine, which makes for ideal street-riding power and torque curve. Focused on making big power through the low and mid-range, this engine uses a valve-train that’s optimized to deliver street-dominating power. 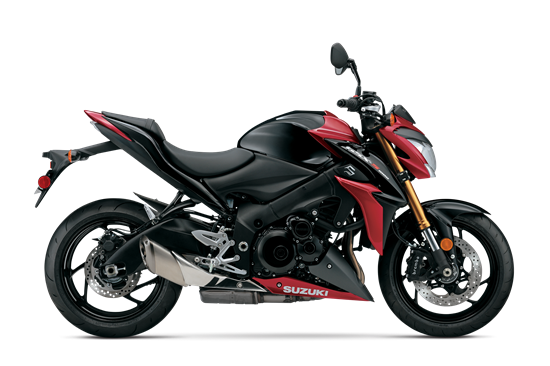 Equipped with a powerful engine, Suzuki’s Advanced Traction Control System*, a balanced KYB suspension, and Brembo brakes, the GSX-S1000 is a street bike packed with some serious performance. Top that performance off with wild, rugged, and aggressive styling, and you have a naked roadster ready to attack and turn heads on the street. With the GSX-S1000, Suzuki changes motorcycling for the better, again. The strong, four-stroke, liquid-cooled, DOHC, 999cc inline-four engine is designed to provide smooth throttle response and controlled acceleration. The profiles of the dual, overhead camshafts were designed to enhance street performance while preserving peak, racetrack-capable power. The GSX-S1000 premiered Suzuki’s Easy-start System that requires just a simple touch of the starter button to fire up the engine (without pulling the clutch lever if the transmission is in neutral). The EFI system uses Suzuki’s proprietary, SDTV (Suzuki Dual Throttle Valve) throttle bodies where the secondary throttle valves are controlled by a servo motor for smooth power delivery. The stainless-steel, 4-2-1 exhaust system helps the engine deliver a strong low-to-mid range punch with an exciting rush to redline. Suzuki’s advanced traction control system* lets the rider to control the throttle with more confidence in various riding conditions. As a result, the rider can enjoy sport riding with less anxiety. There are four traction control modes (1, 2, 3, and OFF) that the rider can easily adjust at rest or on-the-fly via a handlebar-mounted control. The difference between the modes are their sensitivity to road conditions. Mode 1 1 is lowest sensitivity level most suitable for skilled riders or in conditions that have good road surface grip (sport riding on good, smooth roads). Large diameter, wet multi-plate clutch is derived from a GSX-R1000 design to easily transmit power while the rack and pinion clutch release provides the rider with superb friction-point feel. KYB link-type rear suspension, with arched aluminum swingarm and a single shock absorber that features spring preload that is 7-way adjustable with rebound damping force adjustment. Dual front brakes with fully-floating 310mm discs and BREMBO monobloc calipers with four 32mm opposed pistons provide strong and consistent stopping power. Distinctively shaped headlight nacelle contains a bright 60/55W H4 halogen bulb. The tail section houses an integrated LED taillight with clear lens. The lightweight and compact instrument sets uses a LCD display that includes speedometer, tachometer, odometer, dual tripmeters, gear position, coolant temperatures, driving range, average fuel consumption, instantaneous fuel consumption, traction control, and a clock functions. Unique to the GSX-S1000 models, the TRP 6-spoke lightweight cast aluminum wheels are equipped with Dunlop radial tires (120/70ZR17 front and 180/50ZR17 rear).